I received a very interesting note in my post office box yesterday. Seems the USPS (United States Postal Service) has a new service called "Real Mail Notification." This service will send you a text message if you receive mail in your post office box. According to the USPS, "Your time is valuable, and now you'll know when mail has arrived." 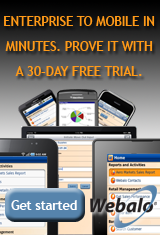 This is a great example of how mobile solutions can save time and money and increase productivity. I only get mail a couple of times a week in my PO box, but I drive in nearly every day to check it. This costs me time, money, fuel, increased vehicle maintenance and lost opportunity costs. A simple thing like a text message notification can make a difference, especially if a company has 50,000 employees and fleets of vehicles. When companies are pondering mobile strategies, it does not need to be an all or nothing effort. There are dozens of very simple and relatively inexpensive ways mobile solutions can start making a big difference.